Down the street from my halfway home in Echo Park is a little spot called Trencher, serving a variety of sandwiches and salads. Normally this would sound boring, but Trencher actually has some pretty interesting options, like the Consigliere and a Fried Chicken Banh Mi. 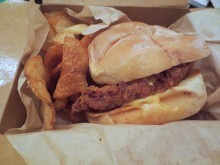 I, however, had my sights set on a different fried chicken sandwich. No ostrich here, just hipster background people. 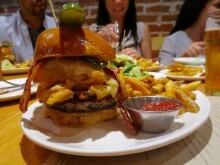 It can probably be said that nearly everything on the East Side is trendy, essentially catering to the crowd of hipsters that have overtaken Echo Park, Silverlake and Los Feliz. One of these places is a restaurant called Ostrich Farm in Echo Park that has no ostriches to be found, but it does have a brunch. 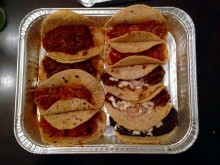 Pittsburgh may be a great city, but it was unquestionably missing the riches of Mexican food that can be found in LA. When I told people about my new digs in Echo Park, a number of them said I had to check out Guisados, which was apparently home to amazing tacos. I took these recommendations to heart, pushed them on my family and set out to pick up a number of these tacos for us to eat. So bright and colory. I must go there! 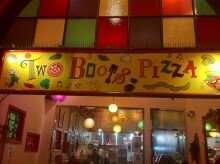 As I walked towards The Echo in Echo Park for a night of dancing to soul music, I passed a little joint called Two Boots Pizza and just knew that by the time the night had ended their pizza would make its way into my extensive digestive system. So when the wee hours of the morning found me stepping out of The Echo, I stepped right into Two Boots and got a looksie at what they had to offer. Although they sold whole pies, a quick look at their slices told me I would be ordering by the slice. These slices were some of the most unique I had seen in a long time, perhaps in forever.